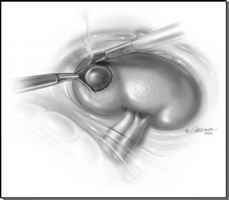 FIGURE2 ■ Transperitoneal laparoscopic view of the left kidney with large anteromedial calyceal diverticulum. 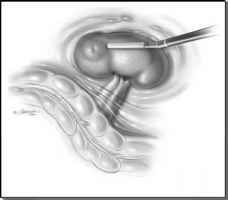 Intraoperative laparoscopic ultrasound is useful in localizing the diverticulum. FIGURE3 ■ Wide excision of the thinned parenchyma overlying the large stone-bearing calyceal diverticulum. dome. 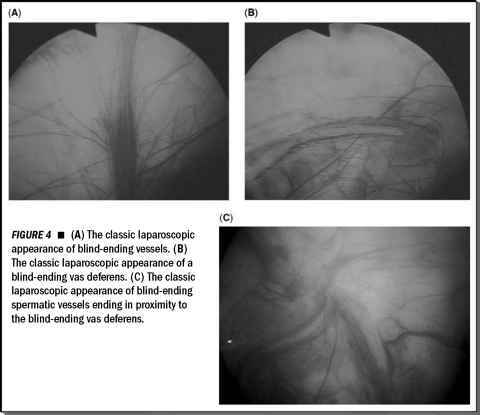 The overlying renal parenchymal tissue is circumferentially excised to expose the base of the diverticulum using monopolar electrocautery hook electrode or scissors, or harmonic/ultrasonic scalpel or shears (Fig. 3).